Editor’s note: We are pleased to welcome Miles Vining as a contributing author on The Hoplite. Miles is a former US Marine Corps infantryman who now researches and writes on small arms and tactical equipment. 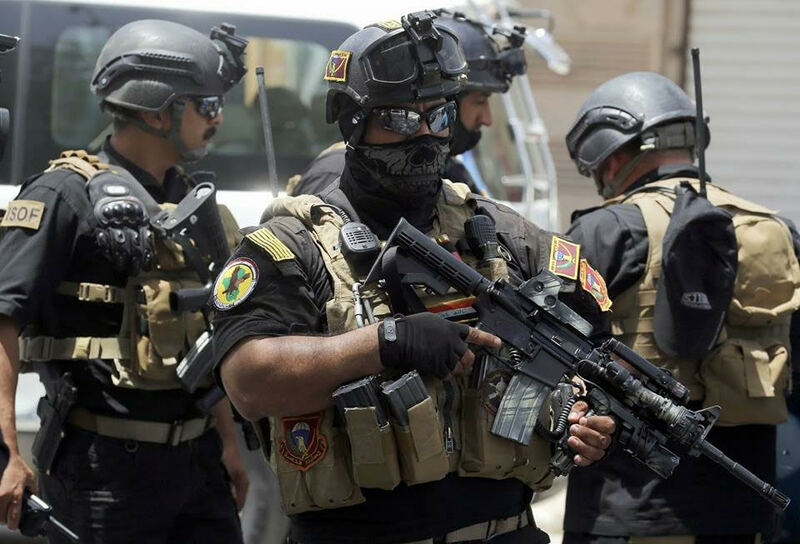 This is the first part of a series examining the arms and equipment employed by the Iraqi Special Operations Forces, in light of the prominent role played by this unit in recent fighting. 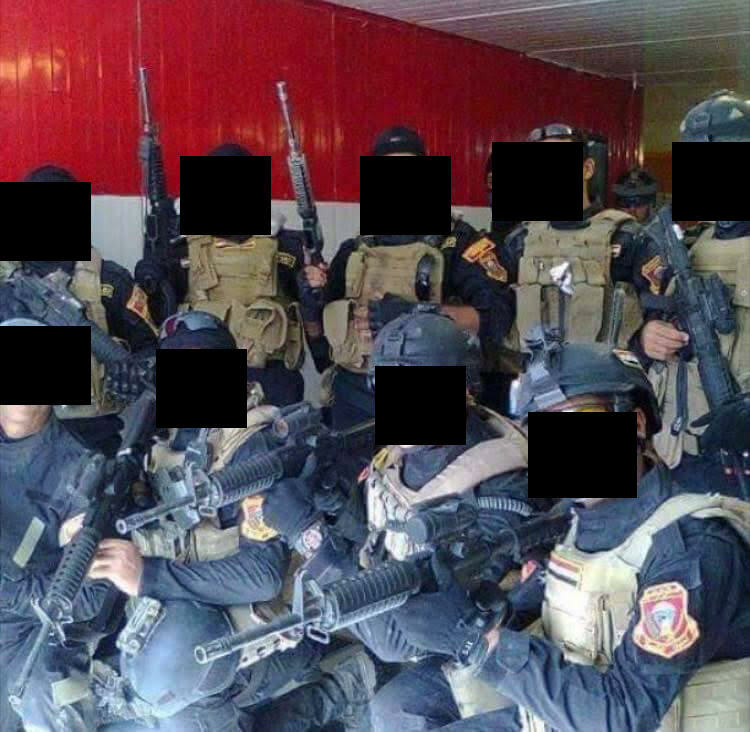 Iraqi Special Operations Forces (ISOF) are one of Iraq’s premier fighting units. 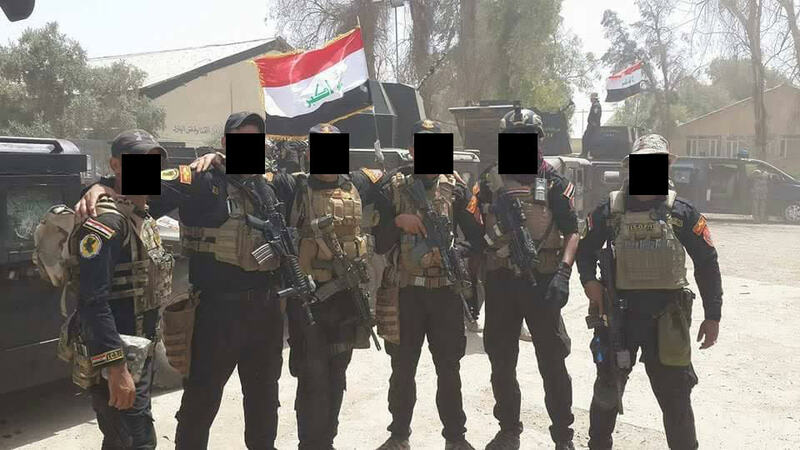 ISOF have been closely mentored by US special operations forces (SOF) from their inception following the 2003 invasion of Iraq. This relationship was substantially reduced when the United States withdrew forces from Iraq in December 2011, but has been re-established in response to ongoing joint operations targeting the so-called Islamic State. As of October 2016, the US SOF personnel advising ISOF have been elements from Bravo company, 2nd Battalion, 3rd Special Forces Group. ISOF have featured prominently in recent news, spearheading the push into Mosul. This post will examine the individual small arms and equipment in use with the unit. 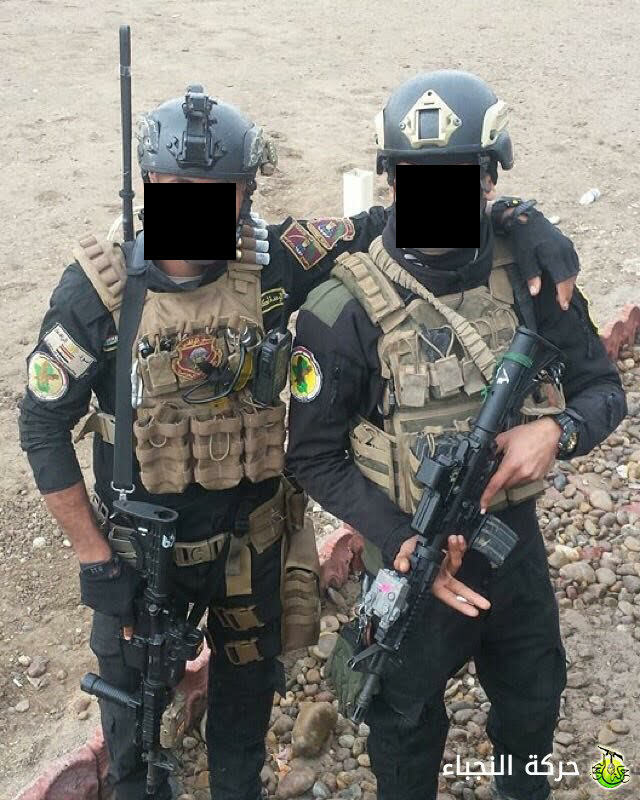 An ISOF soldier, as evidenced by the Iraqi Counter Terrorism Force (ICTF) circular patch on his right shoulder. This features the Iraqi flag against a yellow background with a green country profile of Iraq, and a brown eagle soaring over it. The red and yellow patches on his left arm also signify the regiment. His weapon is a 5.56 x 45 mm SIG Sauer M400 self-loading rifle with an 11.5″ barrel, fitted with a SOPMOD stock, EOTech 512 reflex sight, magazine coupler with two magazines, AN/PEQ-2 TPIAL, and a Grip Pod, white light source, and a bipod that is most likely Chinese in origin. The rifle on the left is a Rock River Arms 5.56 x 45 mm LAR-15 self-loading rifle with a 14.5″ barrel, fitted with a counterfeit Daniel Defense Rail 7.0, Aimpoint Comp M2 Reflex sight, with an AN/PEQ-2 TPIAL mounted at the 12 o’clock position. The soldier on the right has a SIG Sauer 5.56 x 45 mm M400 self-loading rifle with the issued rear sight, and counterfeit Daniel Defense “Omega” Rail 7.0. Both rifles are outfitted with Two Point Slings. Notice the MOLLE belt with four STANAG magazine pouches fastened to it. 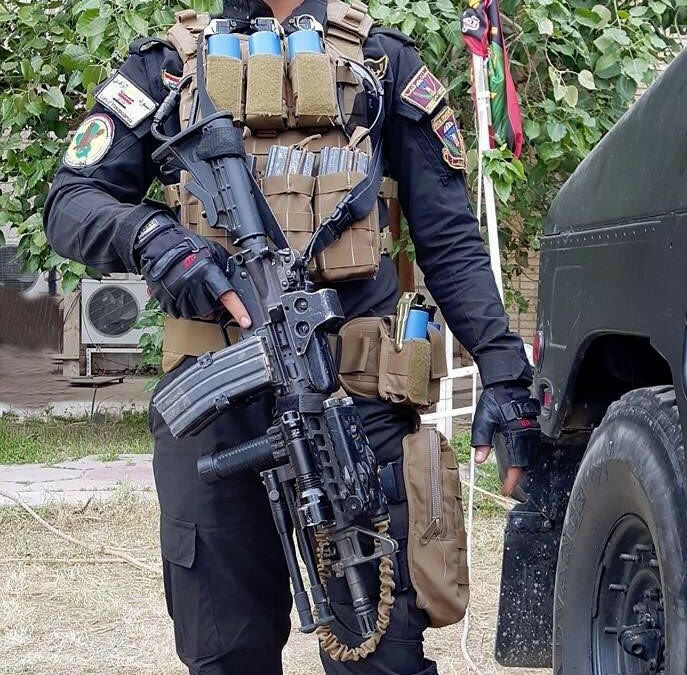 Although the majority of ISOF troops utilise their plate carriers entirely, some troops opt to place MOLLE pouches on a hip belt such as this one. The standard issue rifle for all ISOF forces is the Rock River Arms LAR-15 self-loading rifle chambered for 5.56 x 45 mm. This rifle features a three-round burst capability, 14.5 inch barrel, and Daniel Defense Rail 7.0 MIL-STD-1913 (Picatinny) handguards. ARES contacted Daniel Defense, and found that the Rail 7.0 examples seen in Iraq are believed to be counterfeit copies produced in China. These rifles appear to have been ordered in large batches, all with “CM” prefixes in their serial numbers. However, it appears that they were ordered with M16 carbine length handguards, which were later replaced with the counterfeit rail systems by ISOF or third party armourers. The LAR-15 rifles in ISOF service are generally easily distinguished by the presence of eight perforations in the Daniel Defense Rail 7.0 handguard, rather than the seven commonly seen in Colt designs. There is also an additional row of perforations on either side of the gas tube, underneath the 12 o’clock Picatinny rail. SIG Sauer M400 select fire (semi-automatic and automatic) self-loading rifles with 11.5 inch barrels are also regularly used by ISOF. The commercially-available equivalent model is known as the SIGM400 11.5” SWAT SBR, and is offered to the US military/LE market. One of the differences between the M400 rifles in service with ISOF and SIG Sauer’s catalogue offering is the presence of a standard military specification pistol grip, rather than SIG’s proprietary equivalent. Rock River Arms 5.56 x 45 mm LAR-15 self-loading rifles fitted with the original M16-type ribbed polymer handguards, and Aimpoint Comp M4 optical sights mounted in place of the detachable carrying handles. One exception, at top left, features an EOTech 512. These soldiers are wearing the Diamondback Tactical RBV Predator plate carrier in tan. 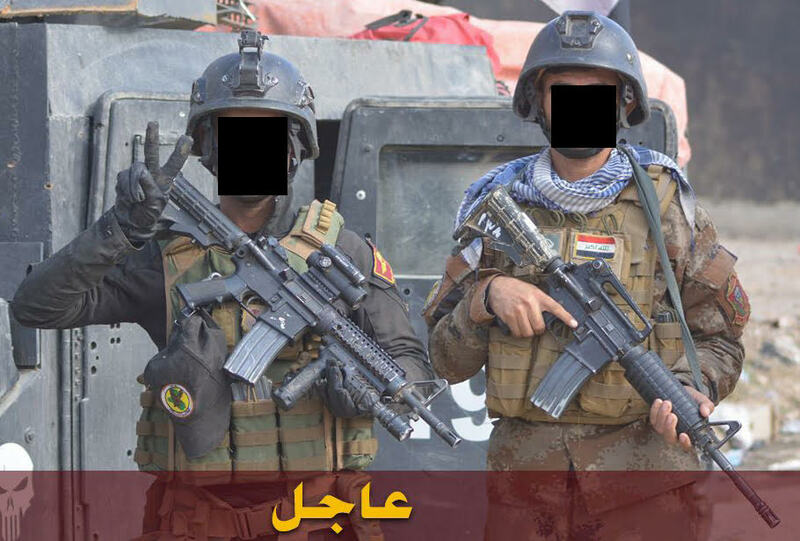 Both the LAR-15 and M400 rifles are issued alongside each other throughout ISOF, seemingly without regard to job requirement or leadership position. According to interviews with ISOF personnel, soldiers favour the longer barrel of the LAR-15, as the M400 has a substantial muzzle blast from its 11.5 inch barrel. In addition to these rifles, there are a number of other AR-15 type rifles which have been observed in use with ISOF. Many of these are Colt AR-15 clones, and have also been documented by ARES circulating on the Iraqi firearms black market. Additionally, there was a large purchase of Korean S&T Motiv 5.56 x 45 mm K2C self-loading rifles outfitted with M4 SOPMOD stocks and Aimpoint sights, but these have since been largely phased out of ISOF armouries. There are also very limited numbers of Colt 5.56 x 45 mm Model 633 self-loading rifles in service. The overwhelming majority of ISOF troops employ 30-round STANAG magazines, mostly of aluminium construction. Some polymer magazines, mostly Magpul models, are also in service. Interestingly, there is a trend within ISOF to use 20-round magazines, most likely issued to drivers or vehicle turret gunners for ease of use within confined spaces. 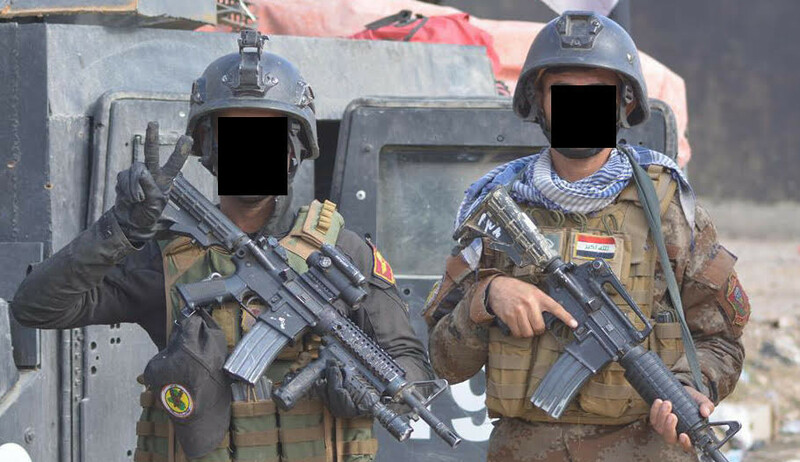 ISOF soldiers with SIG Sauer M400 self-loading rifles outfitted with EOTech optical sights. Note the tan-coloured AN/PEQ-15 ATPIAL on the left and the grey Steiner DBAL-D2 Dual Beam Aiming Laser mounted on the right. The lack of magazines may indicate a training exercise. ISOF soldiers in the back of a light vehicle fitted with improvised armour, armed with Korean K2C self-loading rifles. Note the soldier on the left with trousers outfitted with kneepad inserts and the soldier in the centre with a white light mounted at the 3 o’clock rail position on his rifle; both of these were likely purchased privately. The soldier in the centre also carries an ACH helmet fitted with an Ops-Core ACH ARCS rail. Specialised ISOF troops, such as those assigned light machine guns, designated marksman or sniper rifles, or shoulder-fired recoilless weapons, typically carry LAR-15/M400 rifles in addition to their primary weapon systems. Rifles are generally carried with a single-point or two-point sling. Optics arrangements are a mixed affair, with EOTech 512 and Aimpoint Comp M2 and Comp M4 models comprising the majority of non-magnified sights in use. However, EOTech sights are increasingly less common than Aimpoint examples. 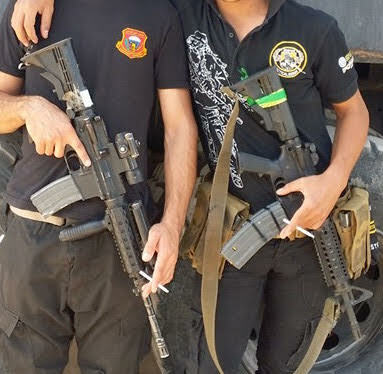 Due to the lack of rear sights on most of these rifles, many ISOF troops have resorted to the use of rail-mounted A2 carrying handle rear sights, whilst others simply go without backup iron sights. There are three Target Pointer/Illuminator/Aiming Lights (TPIAL) in general use by ISOF. The first and most prevalent is the AN/PEQ-2 ATPIAL, which is usually mounted at the 12 o’clock rail on the handguard of a weapon, just in front of any optic or rear sight combination. The AN/PEQ-15 ATPIAL in tan is also observed, despite being far less numerous among ISOF forces. Finally, the commercial Steiner DBAL-D2 Dual Beam Aiming Laser is also in use, and has been observed in both grey and black finishes. Most ISOF troops appear to be issued with AN/PVS-14 monocular type night vision devices, and can thus utilise infrared aiming lasers to ‘paint’ targets at night. Previously, AN/PVS-7 night vision devices (NVD) were used. ISOF soldiers with AN/PVS-7 NVDs while on a night mission. Before the rise of IS, ISOF was mainly employed as a counter-terrorism raid force, often operating at night. In addition to individually-issued AN/PVS-14 NVDs, there are limited numbers of night image intensifiers observed in service with the various precision rifles ISOF employs. For white light needs, many rifles utilise the SureFire M910A Vertical Foregrip, or the SureFire M951 Combat Light Tactical Weapon Flashlight. If neither of these are available, many ISOF soldiers purchase their own rail-mounted light on the local market in Iraq. 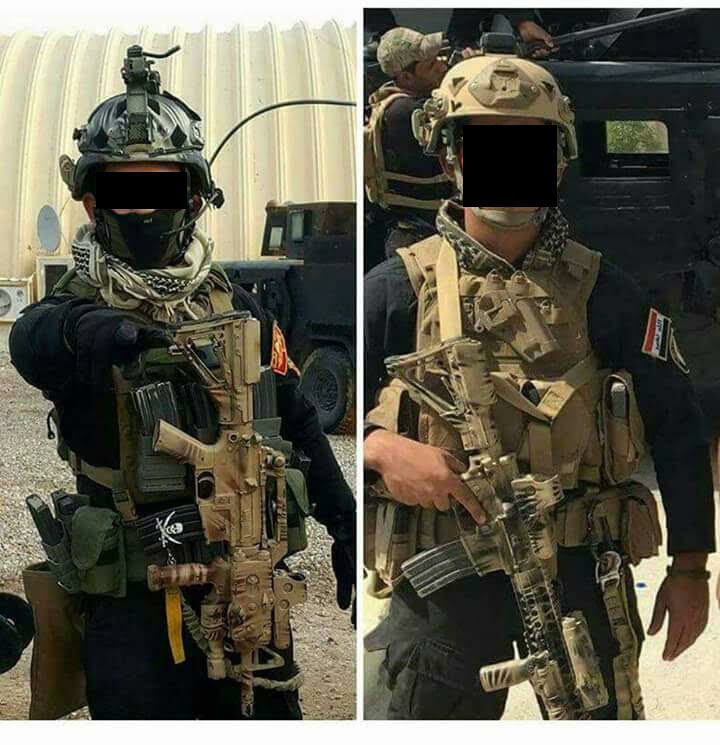 Weapon customisation is popular among ISOF soldiers, often wanting to imitate a similar diversity of items that their western SOF counterparts have on their rifles. This often includes rail-mounted bipods, Grip Pod brand combined foregrip/bipods, pressure switches, non-standard telescoping stocks, and even magazine couplers. 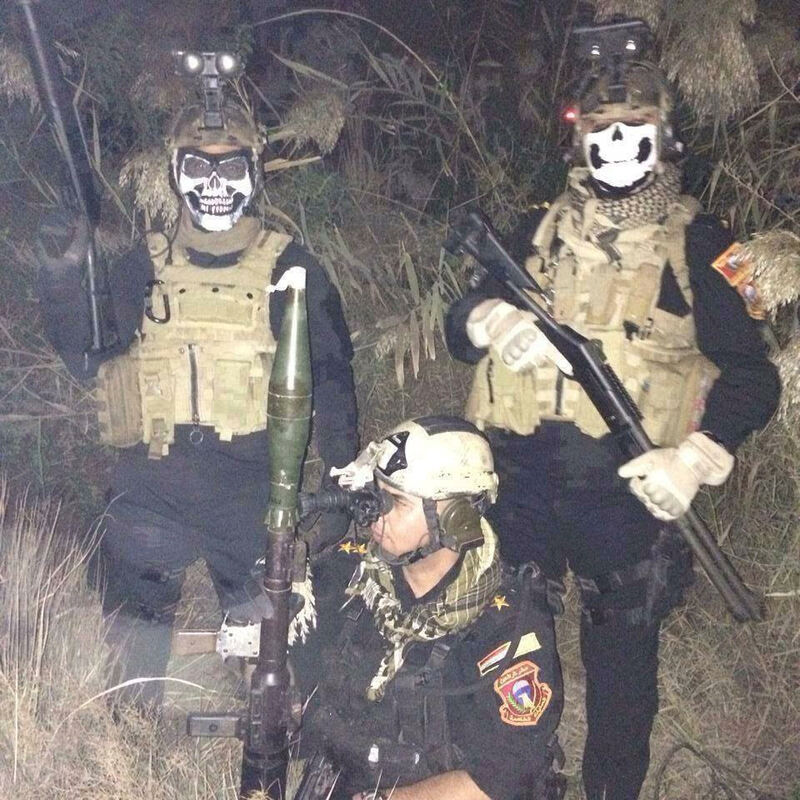 A majority of these products are actually Airsoft products that are imported into Iraq via Turkey or China. Actual firearms accessories have difficulty in passing through customs legally, thus a number of dealers instead import Airsoft products. 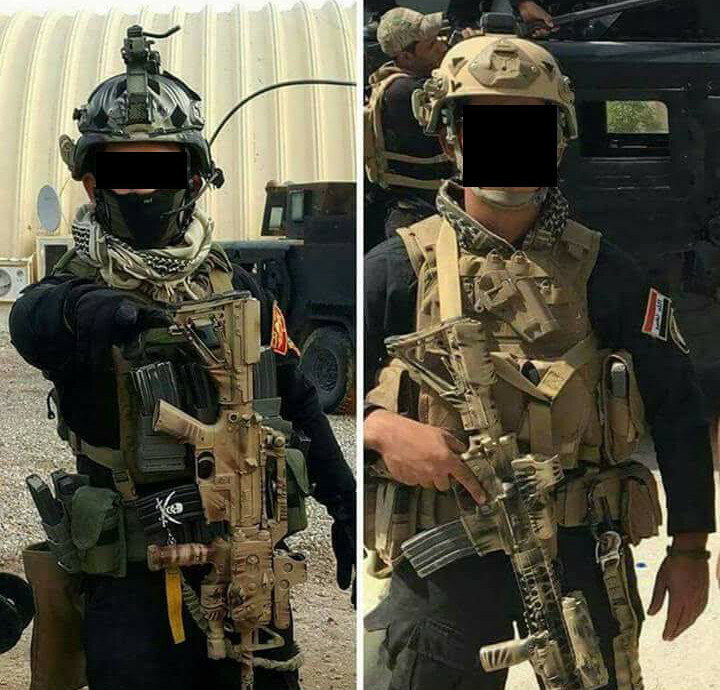 These two ISOF soldiers exhibit a wide range of customisation to their gear, including their Sig Sauer M400 self-loading rifles. The handguard fitted to the rifle on the right is an airsoft replica offered by a company based in Quanzhou City, China. ISOF employ a mixture of handguns, including Iraqi government-issued Croatian HS Produkt HS-9 and HS-45 Standard models chambered for 9 x 19 mm and .45 ACP, respectively. These are supplemented by privately-purchased Glock Model 17 and Model 19, Beretta M9 and Model 92, and Iraqi Tariq handguns, all chambered for 9 x 19 mm. Handguns are normally mounted in drop-leg (thigh) or hip holsters, and occasionally on the chest via a MOLLE platform. A variety of holsters are employed, including genuine and imitation versions of Black Hawk! SERPA, Safariland, and Fobus models. Universal-fit fabric holsters are also commonplace. A popular trend within ISOF is to fit Emerson Universal Handgun Grips to issued pistols, improving grip when hands become sweaty or wet. The soldier at centre is carrying an imitation Black Hawk! SERPA holster mounted at chest level, with a Beretta 92 with a polymer pistol grip cover. The soldier at left is wearing Intercepter Body Armor. The ISOF camouflage scheme is flat black, reflected in their uniforms, and many vehicles including HMMWVs and some MRAPs. Clearly, this colour scheme has limited camouflage value for most operations, and instead serves to provide a distinctive visual signature and contribute to psychological warfare efforts. Whenever ISOF moves through a liberated Iraqi city, civilians recognise the ISOF advancing, rather than the regular Iraqi Army. An updated uniform, with expandable mesh pockets, and mesh inlaid material around the elbow and hip bends, but has seen only very limited issue. 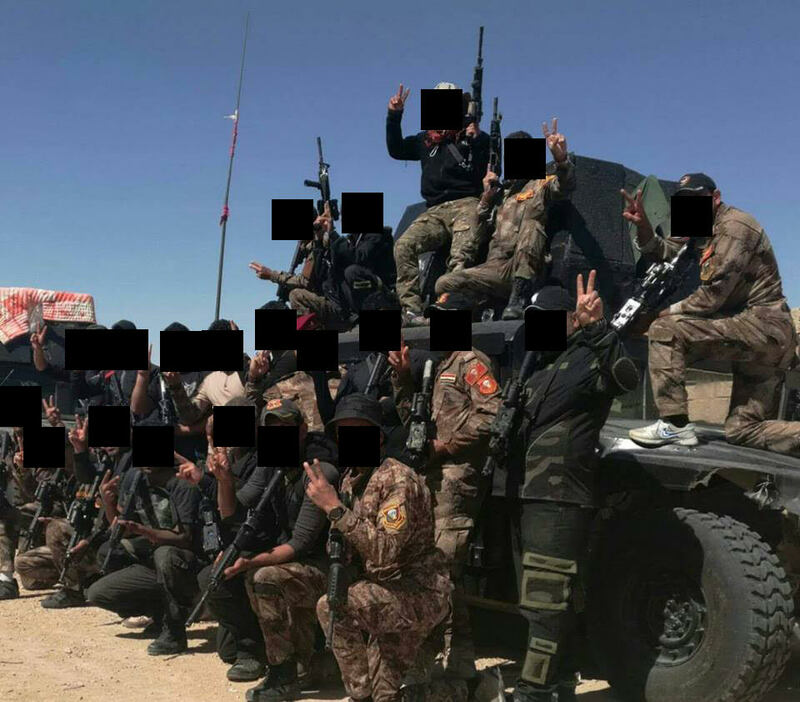 Currently a number of ISOF soldiers in the liberation of Mosul have been supplied with Iraqi Army Chinese PLA Type 07 “arid” pattern camouflage fabric. This uniform has been seen in units also with the all black uniform, but has also been observed in use by entire squads or platoons albeit rarely. The dominant black ISOF uniform on the left, and the PLA Type 07 on the right. The soldier at left has an Aimpoint Comp M4 optical sight mounted on his SIG Sauer M400 self-loading rifle, which also features a counterfeit Daniel Defense Rail 7.0. The soldier at right is armed with a Rock River Arms LAR-15 with the original A2-style handguards. Note the flattened profile of the lower receiver magazine release catch guard and take-down pin spring detent on the M400, compared to the traditional rounded profile of the LAR-15. Additionally, note the rear sling swivel mount on the M400 and lack thereof on the LAR-15. Both are diagnostic identifying features for ISOF rifles. All three common uniform colourways/patterns are visible in this image. Additionally, note the soldier at top with non-standard trousers, which are likely to have been personally purchased. Helmets are also black, and appear to be mostly US-supplied. 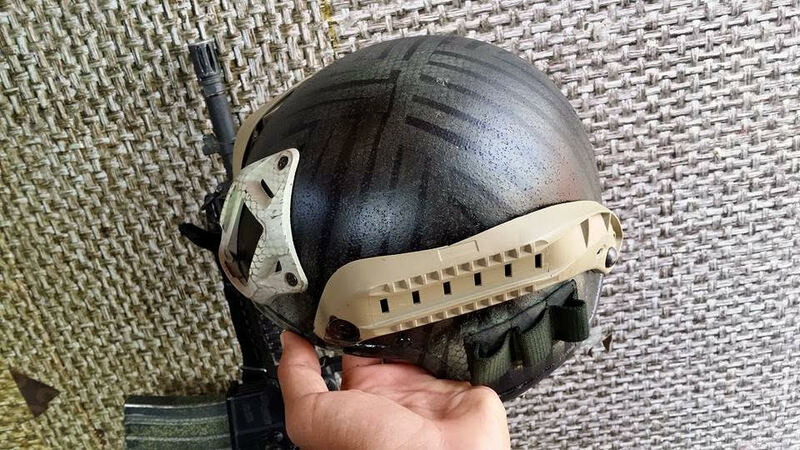 Many of these helmets are inspired by designs in service with western SOF, and may feature, for example, a high brow cut for scope clearance and an opening for electronic hearing protection. A particularly prevalent design is one based on the CVC DH-132b ‘Tanker’ helmet. Another are the standard Army Combat Helmet (ACH), and the Modular Integrated Communications Helmet (MICH) type. Helmet attachments include Ops-Core ACH ARCS side rails and counterfeit copies, SureFire HL1-A helmet lights, diamond-shaped NVD-mounting brackets such as the Norotos Universal Shroud and copies, ACH 4-point chin straps, and assorted PASGT PVS-14 mounting options. ACR MS-2000 series strobe beacons are sometimes observed. MICH helmet with a personalised spray-painted finish. 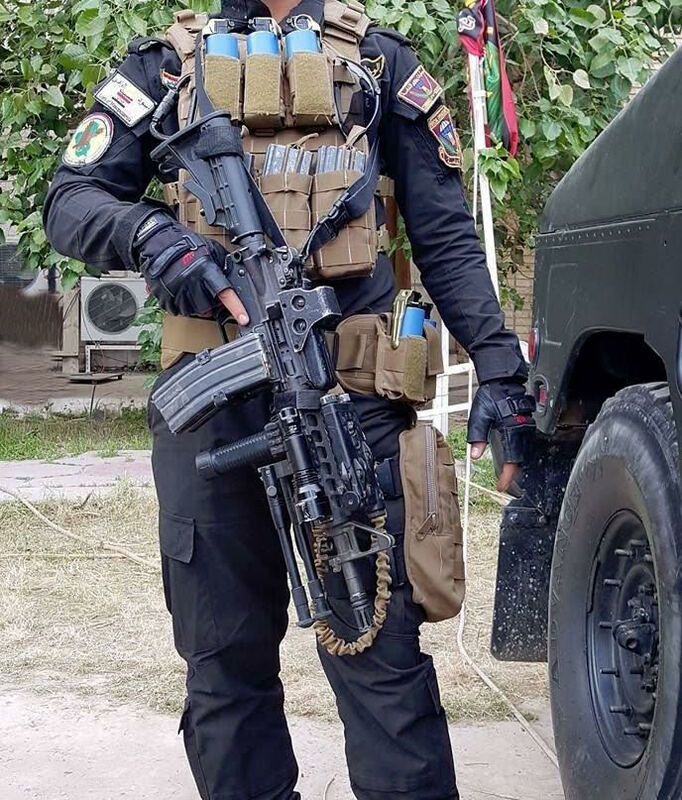 Along with a generic diamond-shaped NVD mount, this ISOF soldier has a set of ACH/MICH ARC imitation rails made by WoSport Industry in Guangdong, China. Below the rails are elastic nylon loops for holding 12 gauge shotgun cartridges. Note the Sig Sauer 11.5″ M400 self-loading rifle leaning against the wall. In contrast to the black uniform and helmet, plate carriers are most commonly tan in colour. Limited numbers have also been observed in dark green or MultiCam. Three types are most common: BAE Systems Eclipse Performance RBAV-SF; Diamondback Tactical Modular Tactical Assault Carrier and RBV Predator designs; and reduced-weight plate carriers without cummerbunds such as Diamondback Tactical’s Battle Lab Advanced Warrior Fast Attack Plate Carrier (FAPC). Locally-acquired and produced variants and copies are also in use, such as those offered by Mushriqui Consulting LLC. Of these, the RBAV-SF and the Diamondback RBV Predator are the most common designs. 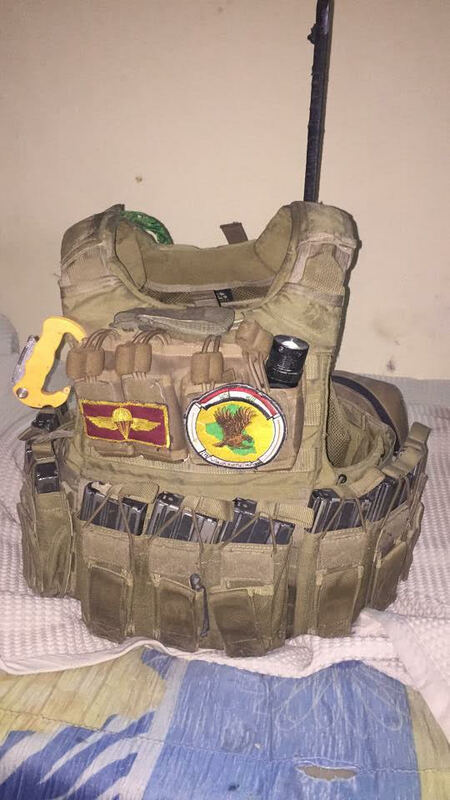 Although ISOF does issue plate carriers, many members purchase additional or alternative personal equipment through local markets, online trading and sales groups, and tactical stores in Baghdad and elsewhere. American-made equipment is highly sought after, and commands a premium price. A BAE Systems Eclipse Performance RBAV-SF with ISOF patches, VHF antenna at the rear, and 9 STANAG magazines mounted along the length of the plate carrier. A typical combat load for US or British SOF is 6 STANAG magazines or fewer. Plate carrier attachments vary from soldier to soldier, but often directly imitate setups used by US Army SOF advisers. This may reflect such nuances as wearing helicopter safety lines on their belt line, complex MOLLE administration pouches, and stacking MOLLE pouches on the backside of plate carriers (so as to be available to teammates). 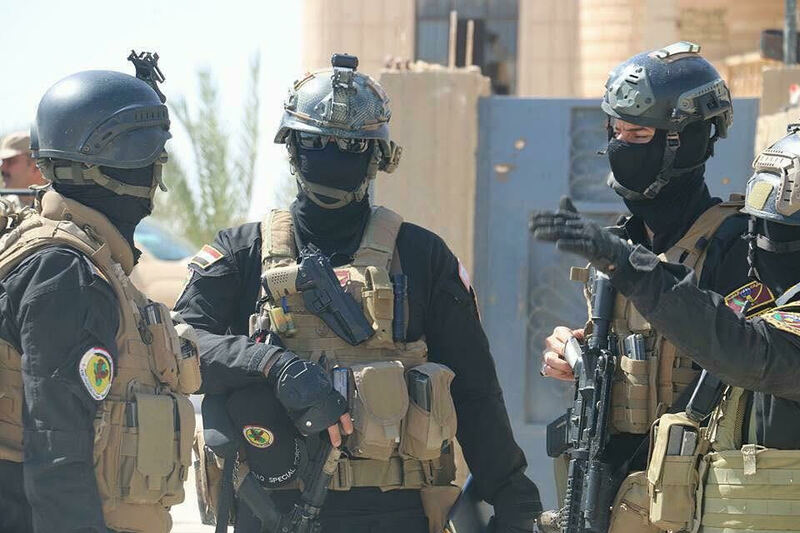 ISOF have also adopted the use of velcro patches to designate separate ISOF brigades, names, rank, and even blood type. 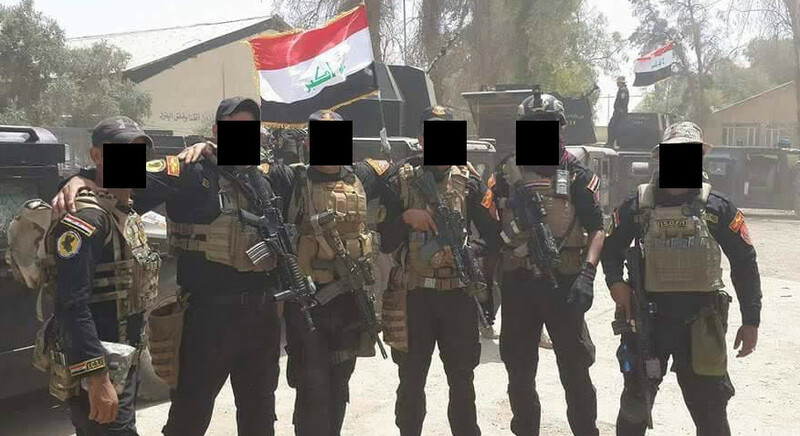 Some ISOF operators proudly display patches received from US or other units. There is a tendency to mount the maximum number of single- or double-magazine MOLLE pouches to the front of the plate carrier, in addition to a number of MOLLE handgun magazine pouches. The carriage of extra magazines is typical of ISOF, and is a result of ISOF’s close reliance on light tactical vehicles, with very limited necessity to move far on foot. This is also evidenced by the lack of hydration devices on plate carriers, deemed unnecessary by ISOF troops due to water supplies staged in their trucks. Many ISOF soldiers carry smoke grenades, including several Chinese made versions and US M18 models. 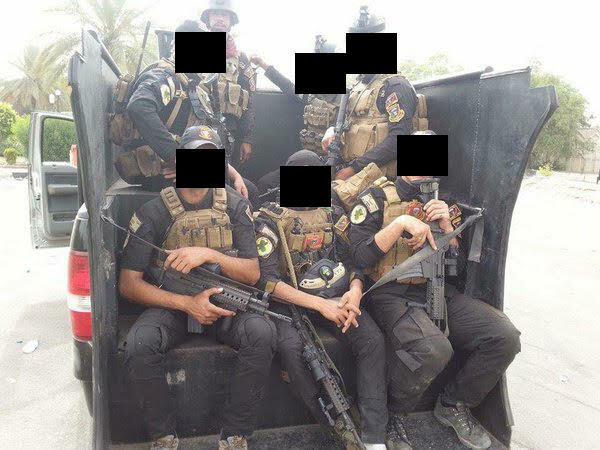 Curiously, ISOF operators frequently attach shotgun cartridge carriage systems to their plate carriers, and often carry 12 gauge cartridges, despite the fact that 12 gauge shotguns are not often employed by ISOF in current operations. 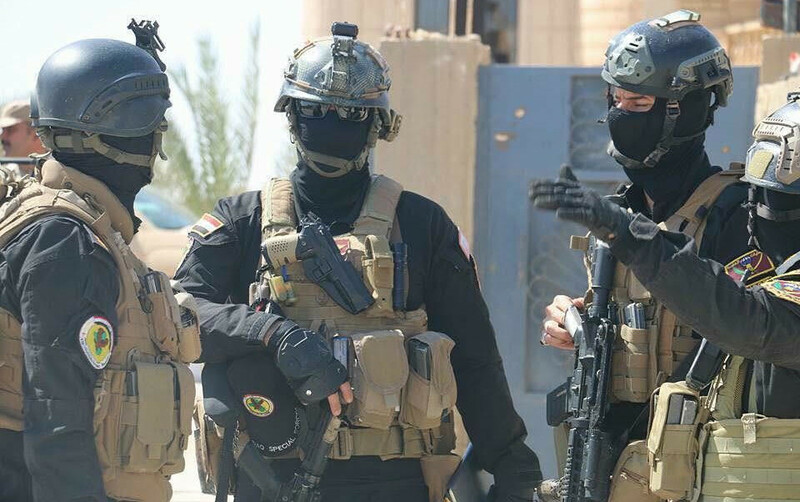 ISOF troops with a diversity of plate carriers, from heavier, encompassing carriers to extremely minimal. These may reflect a similar progression among the Special Forces advisors training ISOF over the years. Also notice the prevalence of tactical belts and pouches that may impinge on foot movement. This is less of an issue for ISOF because of their vehicle-centric tactics. Communications equipment is most commonly Vastone V180, BDXI BDX-218, Hytera PD-782, or Motorola MTP850S commercial two-way VHF/UHF handheld radios, or AN/PRC-152 Multiband Handheld radio, often used with the Harris Lightweight Headset. AN/PRC-152 examples are usually attached inside a MOLLE pouch to the rear of the plate carrier, with a headset underneath the helmet. The much smaller commercial radios are commonly carried in a MOLLE pouch or clipped to the front of the plate carrier. Typically, only soldiers filling leadership positions are equipped with communications devices. HMMWVs have their own communications setup, typically the Falcon III AN/VRC-110 amplifier, with mounted AN/PRC-152 radios. It appears that the HMMWVs are also equipped with AN/PSN-13 Defense Advanced GPS Receivers as well. 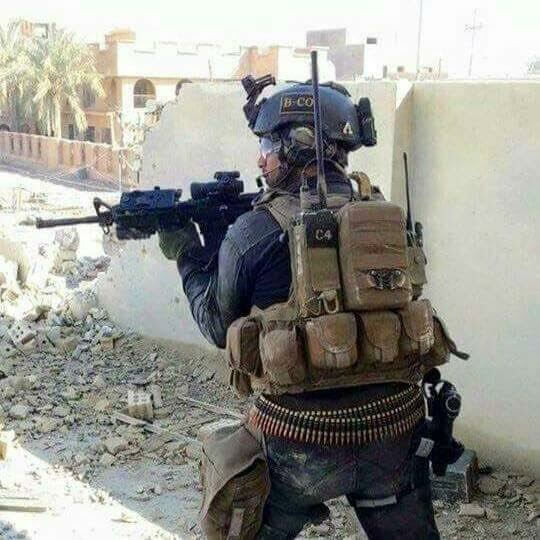 This ISOF soldier is equipped with a VHF/UHF AN/PRC-152 Multiband Handheld Radio with headset underneath a CVC DH-132b, in addition to a Motorola handheld radio mounted on the right side of his plate carrier. These commercial radios often come equipped with a handset mounted on the front of the soldiers equipment. The smaller pouched attached underneath the radios may be a quick access pouches for spare batteries. Photos taken from various ISOF social media channels and local news aggregator websites.